We would like for your stay in Venice to be as comfortable and nice as possible. Here is a small list of our favorite places in the area. 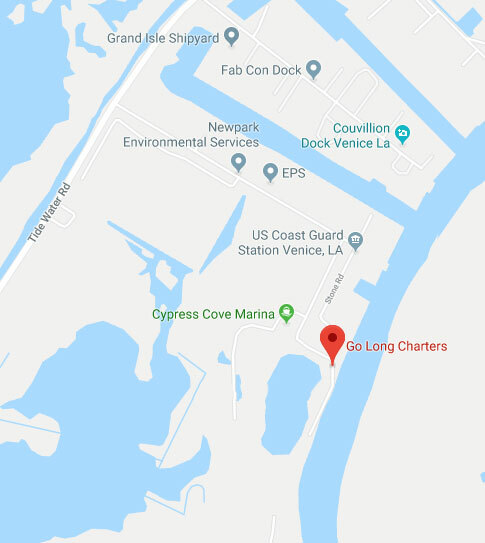 NOTE: when booking your lodging, please mention that you are fishing Venice with GO LONG CHARTERS, this will ensure that you get the best rate for your lodging. If you prefer that we arrange your lodging, that is an option as well. The condo is a private water side rental with a boat dock located at Cypress Cove Marina. The condo can accommodate up to six guests but may accommodate as many as ten if special arrangements are made. The condo has a full kitchen, three bedrooms and two baths. A 600 pound ice maker and gas grill are available for guests to use. A large covered patio as well as a large back deck overlooking the water allows for maximum relaxation while lounging around in one of the many outdoor chairs or swings located at the property. Cypress Cove Marina has a fish cleaning station that allows for speedy cleaning of fish or ducks without having to worry about discarding carcasses. Cypress Cove is a full service marina complete with fuel, ice and bait. The Log Cabins are owned and operated by Fish Intimidator. This is one of my favorite spots. This is two brand new log cabins. Each sleeps up to 7 people and everyone gets their own bed (NO BUNK BEDS). The cabins are on a big private lot with a huge pond in back. Also included is an awesome covered bar area in back with a fish cleaning station and a big flat screen up on the wall! Have you ever been able to watch TV and clean your fish? It is very nice, you will not be disappointed!! Fish Intimidator also offers full meals while you are in Venice. They will prepare a super nice dinner as well as breakfast and lunch for the boat. Meals are a nice option for those of you who just want to relax and not have to worry about cooking while you are on vacation. Next on the list is The Saltgrass Lodge. Now, talk about nice. This place will leave you speechless! Saltgrass is one of the ONLY lodges in Venice with a swimming pool. This is a beautiful 4 story home. The home sits on a huge private lot and overlooks the Mississippi River. You can relax on one of the many outside decks and watch the cargo and cruise ships go by. Your wife will love you for staying here. I did mention the pool right? Saltgrass also offers full meals while you are in Venice. Your drinks are also included (alcohol). Saltgrass will see to it that your stay in Venice will be as awesome as the fishing. Nearly seven-thousand square feet of elegance and delicacy, the Saltgrass Lodge in Venice, Louisiana is a beautiful antebellum-style home overlooking the Mississippi River. The Lodge achieves a special type of nostalgic luxury with special consideration to classic Louisiana plantation architecture. The lodge is now a quaint escape in the heart of bayou country Louisiana. Inviting rocking chairs on the wraparound porches keep watch over cargo and cruise ships navigating the currents of the Mississippi River. A cabana-lined pool deck, Jacuzzi bath, and gourmet meal complete the daily itinerary for visiting sportsmen and familes. Saltgrass Lodge consists of four levels. The ground level is a covered open-air entertaining area that allows large groups a reprieve from the hot summer sun or inclement weather. Come dine on the Second Level where you'll find the kitchen, dining and living rooms, as well as the Cypress Room- a cypress wood-lined room fit for card games . The level is also surrounded by a wraparound porch with French door entry and exit from all rooms. To the rear, an extended deck features an outdoor kitchen along with seating for dining or lounging. The Third and Fourth Levels are rooms and suites.